One of the most popular trading strategies of the last couple years is the short volatility trade – up until February of this year, the strategy could almost do no wrong. With dividends and fixed income not producing enough yield for many income investors, short volatility was used to fill the void. And it worked like a charm. For pretty much all of 2016 and 2017, if you sold market volatility (generally accomplished by using volatility ETPs), you made money consistently. It wasn’t until the volatility spike in February, and the subsequent volatility ETP implosion, that many casual traders realized the dangers of shorting volatility. That’s not to say selling volatility is a bad idea. 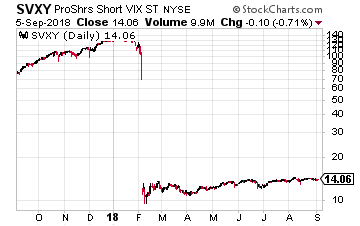 Quite the contrary, intelligently shorting of volatility (adhering to a strict risk management plan for one) can be a great way to generate income. 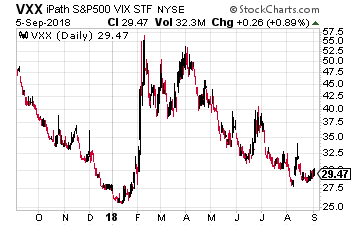 Even after the death of XIV (a short volatility ETP) and the declawing of Proshares Short VIX Short-Term Futures ETF (NYSE: SVXY), going from -1 inverse short-term VIX to -0.5 inverse, shorting volatility has persisted. Yet, there’s certainly less of a market for short volatility strategies than there once was. No doubt, many casual volatility sellers were hurt by the February volatility event. And perhaps more importantly, realized volatility has been higher for much of this year. Let’s face it, there’s a reason why volatility selling was so profitable for so long… there was nothing going on. These days, well, there’s definitely a lot more to worry about on the macro level. We have potential trade wars and tariffs, a US administration that’s a wild card, and renewed debt concerns in Europe. In other words, there are reasons for higher volatility, and savvy traders are not going to blast out volatility against a rising tide. On the other hand, when volatility is higher than normal, it’s often the best time to sell. Most spikes in volatility don’t signal an impending stock correction. And, we are in the midst of strong economic growth. Chances are, a short volatility strategy will pay off in the near-term. So how do you decide when to sell volatility? There are plenty of metrics to look at beyond the VIX price itself. You could delve into the VIX term-structure or look at the put/call ratio in key market indices. You could also see what big trades have happened in volatility products and what they may portend. For instance, a huge block trade that caught my eye this week was a trader selling nearly 13,000 of the iPath S&P 500 VIX Short-Term Futures ETN (NYSE: VXX) 47 calls expiring on October 5th with the stock at $29.61. The trader collected $0.58 per contract or around $740,000 for the trade. As you can see from the chart below, VXX doesn’t look like $47 is within reach over the next month (breakeven for the trade is actually $47.58). However, don’t forget that when volatility spikes, VXX can move huge percentages in a day. While this trade is highly likely to be a winner, the call seller is also open to unlimited upside risk. Of course, we don’t know what this trader is doing behind the scenes. The risk may be hedged in other ways. But as a general rule of thumb, it’s a bad idea to sell uncovered calls like this. It’s imperative that you have your upside risk under control, especially when selling volatility. If you do think selling volatility is in order over the next month, then I’d recommend simply buying puts or put spreads. In that way, you have defined risk, with a chance to still make decent profits if no volatility event materializes prior to expiration. The October 5th 27-29 put spread (buying the 29 put, selling the 27 put) only costs about $1 (with VXX around $29.70) for 30 days of control. At that price, making around 100% profit is an achievable goal and your max loss is just the premium paid. And it's as simple as using these 3 proven trading strategies for earning extra cash. It's all revealed in my new FREE special report. Click here right now for your personal copy.